Here is my review for EOS Xtravaganza (G-210) Violet circle lenses, sponsored by MukuChu. These lenses have a much wider "hole" in the middle than most other lenses on the market, so the color part is smaller. Nevertheless, the design is very eye-catching and the color is quite bright. Enlargement-wise, these are 14.5mm lenses so it is quite noticeable. 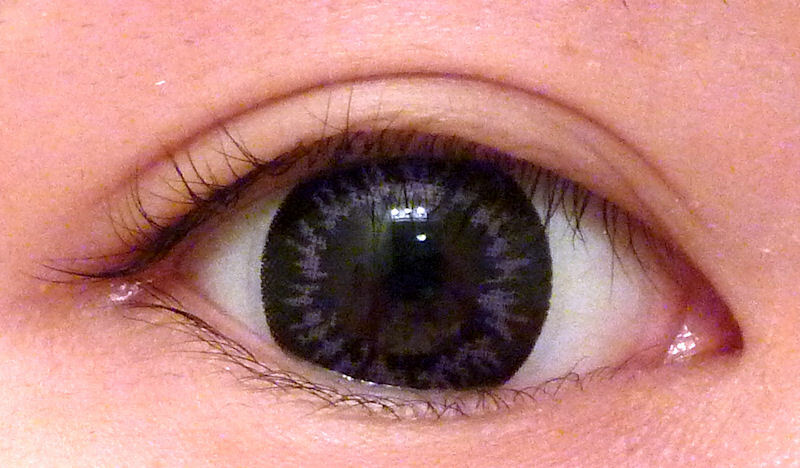 The dark outer ring helps define your eyes as well. Here are the Xtravaganzas compared to my EOS V-202 grey, a series with narrow color parts. The Xtravaganzas are a little bit larger, and the color is definitely brighter. 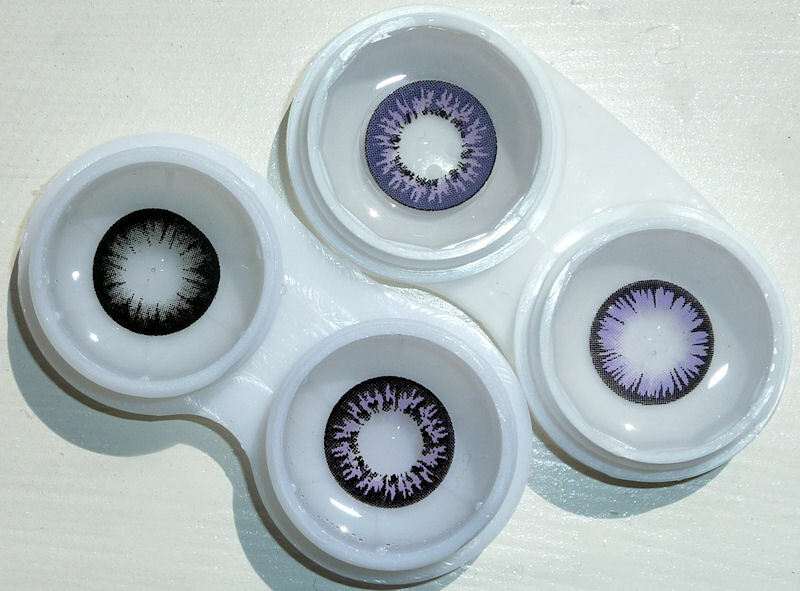 I also compared them to my favourite violet lenses, G&G Bt02. They look a bit dark compared to the G&G lenses, but they are larger. Here are all the lenses I used in this review. Clockwise from the top: Xtravaganza Violet upside down, BT02 Violet, Xtravaganza Violet right side up, V-202 Grey. 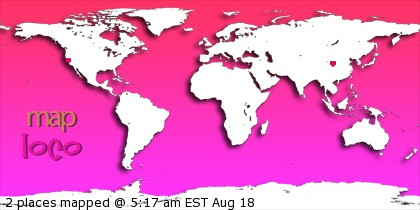 Design: 9/10 - I like the design, I just wish the color part is wider. TOTAL: 8/10 - I think this series is pretty unique in terms of design, and they are pretty noticeable as well. Beautifulll circle lens they really bring our your eyes! 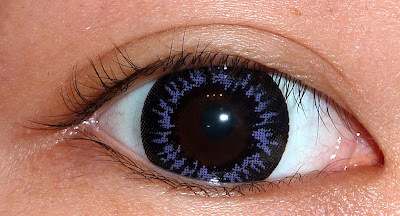 Mmm- violet lenses. <3 Lovely colour on you! 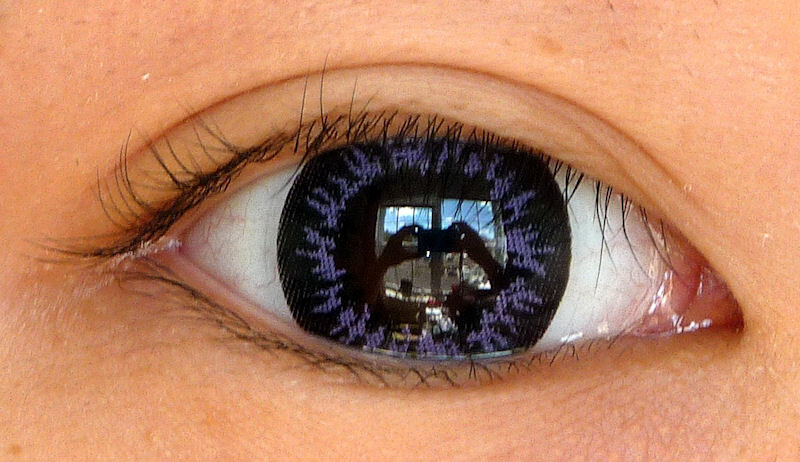 i was wondering what size do you wear in regular contacts? bounphama: I don't wear regular contacts, sorry...I think they only come in one size in general, and have different curvature and prescription, right?